A plane including a wingspan so wide, an engine so efficient or wingtips that fold has never been produced before in Boeing’s century-long history. The 777X family is going head-to-head against rival Airbus’s A350 in the twin aisle, twin jet market. Efficiency is critical, with the cost per seat per nautical mile vital to customers – and thus to success. Officially launched at the November 2013 Dubai Airshow, the 777X program is at the firm configuration stage for the 777-9 (though not yet for the 777-8), with detailed design to be known this year. The company’s timetable has production beginning the year after, final assembly slated for 2018, flight tests in 2019 and final delivery in 2020. The 777-9 boasts a range of 14,000 km. According to Boeing, the plane is 12 per cent more fuel efficient than its direct competitor. Part of its high performance involves the use of carbon fibre reinforced composites, like the company’s 787. The 787 is roughly 80 per cent composites by volume and 50 per cent weight. The company declined to say what the composite makeup of the 777X would be, but that it was important to getting the desired results. “When you combine groundbreaking engine technologies with Boeing aerodynamics and an all-new high-efficiency composite wing, you get an airplane that will be unmatched,” a spokesperson from Boeing said. The planes will exclusively use GE’s GE9X engines, which feature nozzles made with 3D printing. Each engine can generate a 450,000 N thrust, and feature GE’s largest fan ever at 3.35 m.
The raked, folding wingtips of the 777X were researched and originally built for the 777, though ditched in the final design. The folding wingtips are novel, but they aren’t there as a gimmick, said Boeing. During flight, wingspan is 71.8 m; this is reduced to 64.8 m when on the ground so the plane can safely use airport gates and taxi about without getting in the way. “By adding folding wingtips, we are able to increase the wingspan, reduce the associated engine thrust and fuel used, and maintain airport compatibility with the existing 777 family,” said the spokesperson. The folding mechanism used will be “simple and reliable”, and has similarities to the operation of a landing gear door. “The folding wing tip will be deployed and stowed with an actuator that is inside of the wing near the fold,” Boeing said. 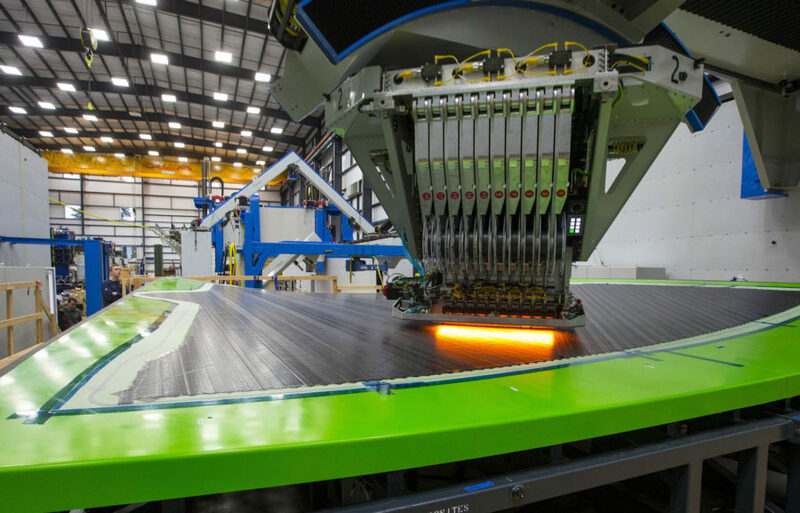 Automation and tooling specialist Electroimpact has been supplying the world’s aerospace leaders for three decades, but it’s only fairly recently that the Washington firm has made a name for itself in composite manufacturing cells. The October 2014 announcement of work providing wing skin and spar-fabricating robots to Boeing’s 777X program was a special moment for the company, which showed off the new 10 m behemoths for the first time in February 2017. Between 80 and 100 engineers were on the Electroimpact wing project at its height. Low rate initial production will use two robots for creating wing skins (34 m long and 6 m at maximum width) and one for the C-shaped wing spars. Wings and spars are each made in one piece, using a process called automated fibre placement (AFP). The company turned its attention to composites in 2004 due to the insistence of Boeing (its first customer). It now has some claim to leadership in AFP, said Lead Engineer (Controls) and Project Manager Todd Rudberg. “After 12 years of developing the product line, making our process better, adding inspection equipment to the cell and looking at overall cell efficiency, I feel we are emerging now as the leader in fibre placement,” Rudberg said. Each skin-fabricating AFP robot for the 777X is on a 14 m-wide gantry, with a 1.54 t head dispensing epoxy resin and fibres from 20 spools. Its spar-making counterpart is loaded with 16 spools on a half-tonne head and lays out 1.2 cm carbon fibre tape. The modularity of the heads, which can be changed in 30 seconds, is important for reliability. Rudberg said that “if the process goes down, we can grab a different head and get back to work”. New for the 777X project is ‘lap and gap’ inspection, which can measure gaps between tows of carbon fibre to 0.1 mm. “It actually has a steerable, very high-resolution camera that could take a picture of the edge of every tow, and we’re able to measure its position in space,” explained Rudberg. A laser points out any discrepancy automatically. It has been built into its AFP cells from the beginning, said Rudberg, in areas like the simple pneumatic actuators used and a short two path of 0.91 m, no matter how the head is oriented. Building on top of these principles, improvements have been incremental and cumulative over 12 years. The new generation of giant robotic machines are really nine-metre tall 3D printers. Electroimpact has the focus and commitment to problem-solving that you’d expect from a business that proudly points out on its website that, of 620 professionals, “more than 500 … employees have engineering degrees”. Its founder and CEO, Peter Zieve, has a PhD in mechanical engineering. For the engineer-led organisation, optimisation is a race with an ever-receding finish line. One area for optimisation in their AFP robots is tension in the tows, leading to a higher payout, said Rudberg. “Right now we’re successfully doing 3600 inches per minute (152 cm/s) on complicated geometry, but we’d like to break 4000 with that,” he added. By his count, there are 45 AFP installations (including one at NASA’s Marshall research facility) and about 60-70 heads around the world. None of these installations are in Australia, though the company does have a presence here and has provided things including build, drill (robot cell) and laydown tooling for Boeing’s 787 work at Port Melbourne. Each fibre placement cell is more-or-less custom made. The concept is stable, but work envelopes are generally different for every customer’s project and machines will shrink or grow accordingly. There are always things that can be tweaked, and new approaches that can be explored. A company of engineers can’t stay happy unless they’re improving things. “New ideas emerge and since we don’t have a backlog of equipment to sell, we usually jump on those concepts right away,” explained Rudberg. Of Electroimpact’s 45 or so AFP system installations globally, one is involved in creating “the biggest lightweight composite parts ever made for space vehicles”, according to a NASA Tech Brief from August last year. Following work with NASA Langley to develop what was named ISAAC (Integrated Structural Assembly of Advanced Composites), the Electroimpact unit – with a 7 m arm and a 12 m track – arrived at the Huntsville facility. It is able to “drastically reduce the cost and improve the quality of large space structures,” said John Vickers, manager of NASA’s National Center for Advanced Manufacturing at Marshall. The need for NASA to own such a system was pronounced, according to a 2014 paper led by Chauncey Wu, senior aerospace engineer at Langley. The paper pointed out that the agency lacked state-of-the-art composites fabrication for research and technology development. “Selected components of the Orion spacecraft … are likely candidates for further development,” according to the paper. Near-term work for the robot, according to a statement from Marshall last October, is “focused on affordable lightweight structures for future configurations of the evolved Space Launch System and on super-lightweight structures for spacecraft for our journey to Mars”.